If anyone has paid their dues to sing the blues, it is James Armstrong. After the release of his debut recording on HighTone Records, Sleeping With a Stranger in 1995, Armstrong was considered to be one of the "young guns" of the blues. Sleeping With A Stranger received rave reviews and Armstrong had established himself as a popular performer in Europe. A major U.S. tour and a second record were planned for early 1997, designed to establish James Armstrong as a major blues name in the States. Tragically, in April 1997, an attacker broke into Armstrong's Northern California apartment, nearly stabbing Armstrong to death and throwing his son, James, Jr., out of a second story window. Fortunately, both survived the attack, although James, Sr. continues a grueling physical therapy program to regain the full use of his right arm and hand. James Armstrong's second HighTone recording, Dark Night, is a product of the events shaping Armstrong's life over the past eighteen months, coupled with his desire to make a full recovery and to return to the music that he loves. With help from his many friends and fans, Dark Night appears to be the affirmation that James Armstrong is back and better than ever. As Armstrong continues his fight to regain his physical prowess on the guitar, lead guitar duties on Dark Night are handled by Michael Ross. The CD also includes guest guitar appearances by Joe Louis Walker on "Trouble On The Home Front" and "Standing In Your Way," and Doug MacLeod on "Bank Of Love" and "Just In Case." Six of the twelve songs on Dark Night are written or co-written by Armstrong. The CD opens with the title track, "Dark Night," an original tune that alludes to Armstrong's experiences in the last year and a half, but offering the optimistic line, "It's a dark night, but I can still see the light." The sound of "Dark Night" is smooth, emotion filled and gets the CD off to an excellent start. On the final song, "Just in Case," Armstrong debuts his newly acquired skill on slide guitar, coupled with a fine Doug MacLeod solo. The highlights abound on the songs that lie in between. I particularly enjoyed the feel of "Slender Man Blues," featuring a nice piano break by Parris Bertolucci. The catchy "Lil' James," offers insight into Armstrong's love for his son, James, Jr. It is easy to sense the pride Armstrong has for his son, as well as the gratitude that he is still around to enjoy. Joe Louis Walker's presence on the CD is apparent through his distinctive solos on "Trouble On The Home Front" and "Standing In Your Way." "Bank of Love" is another fine song, comparing love to maintaining a bank account. "Bank of Love" also features another very nice guest guitar solo by Doug MacLeod. Dark Night offers listeners a smoother, more polished sound that on Sleeping With A Stranger. Armstrong's sound is clearly blues, but the CD offers some jazz and gospel feel in various songs. This combination of styles helps to make James Armstrong's sound clearly his own. 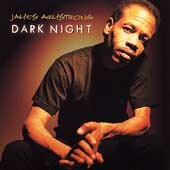 Dark Night is a fine CD that allows the listener to share "the light" with the resurgent Armstrong. the CD is definitely worth a listen and more. This review is copyright © 1998 by Dave "Doc" Piltz, all rights reserved. Copyright © 1997-2000 Ray M. Stiles. All rights reserved.